← New Year, New Office: Hallo Deutschland! 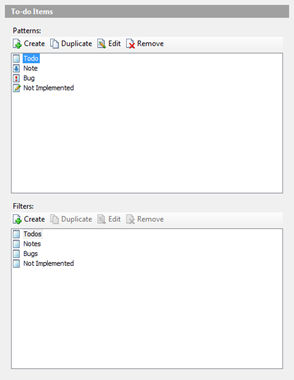 Have you ever had the need to place a TODO in your code? I’m sure we’ve all done so, for some reason or another. Normally it’s just a temporary reminder that we’ll get back to after finishing off something else, in an attempt to avoid breaking the expensive flow we get our minds into when writing code. The problem with this, apart from the inconsistency that can cause you sleepless nights, is that things can get lost. 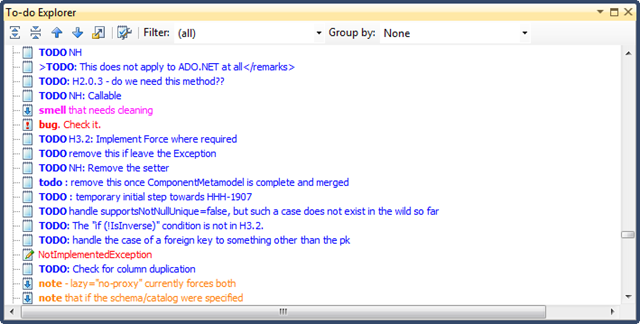 The TaskList feature in Visual Studio requires these kind of comments to follow a certain pattern, and even when that occurs, the way they are presented leaves a bit to be desired. 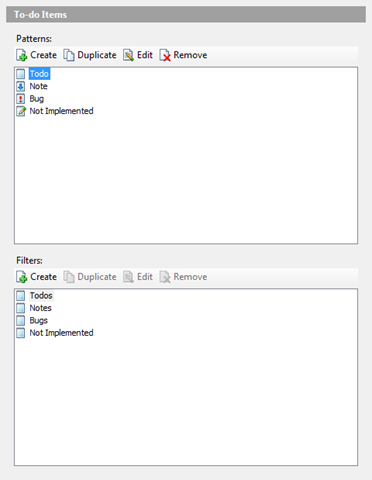 ReSharper ToDo management adds several benefits over Visual Studio’s built-in. But before we see these, let’s first examine how we can solve the previous problem. To recall, what we want to do is be able to support multiple formats when it comes to defining comments, so // TODO: fix this and // add this to the list of ToDo’s to fix both would appear under the list of ToDo’s. As opposed to the default Visual Studio, with ReSharper we use regular expression. This provides us with the flexibility required. 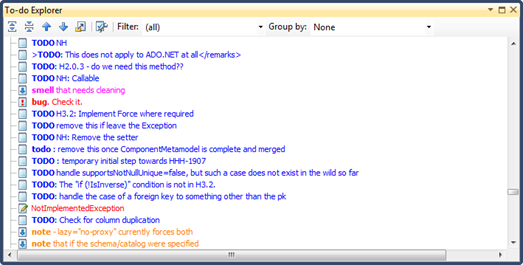 The above example for instance is telling ReSharper to search for any pattern that contains the word TODO in it. By default, normally these patterns are searched for in comments, although we can optionally look in strings and identifiers too. 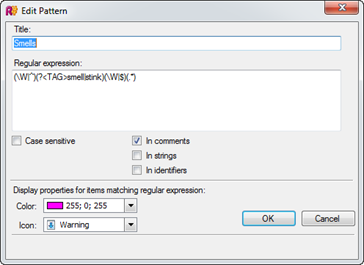 We do not have to worry about defining case-sensitivity in the regular expression. Instead we can just mark the Case sensitive checkbox if we require it. Finally, we can define the color and icon we want displayed when viewing the list of items (which we’ll see later on). which can also be customized using under Tools | Options (accessible too from the To-do Explorer [icon to the left of Filter]). Last but not least, we can also group items by a variety of options, from namespaces to projects, to types, etc. Now that’s what I call a colorful, albeit long list of tasks! Everything is beautiful until you want to use NOTE: keyword. If you have resx files, its not possible and there is no way to exclude them :S I tried, I submitted a bug in jira and youtrack. 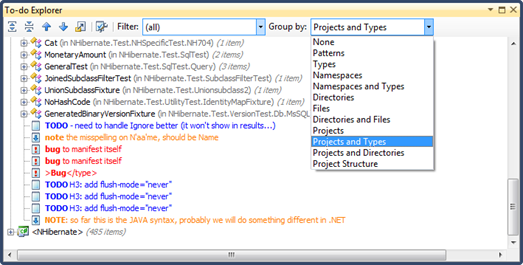 You will see thousands of ‘Note – application/x-microsoft.net.object.binary.base64 is the format ‘ in the Todo Explorer. One for every resx file. So if your application is globalized, good luck. Have you tried changing the regular expression for the Note? Also could you give me the YouTrack ID number please if you have it? @Roland’s issue has annoyed me too for ages now. I’ve only just realised how simple it is to fix – just change the tag to “NB:” and viola! Quite ironic seeing as I think it was me who requested this feature in the first place (http://youtrack.jetbrains.net/issue/RSRP-21929)! Does anyone know if there is a description of how the RegEx can be customized??? 3 capture groups, 1 named TAG. The word TAG makes whats matched displayed in bold. Ahem… speaking of not being TOO attentive, your article says “we developers, aren’t necessarily to attentive to such things” are you sure that it’s not “we developers, aren’t necessarily too attentive to such things”?? ?